This article is about the mammalian family. For the koala and extinct bear-like marsupials, see Phascolarctidae. "Ursine" redirects here. For the village, see Ursine, Nevada. For other uses, see Bear (disambiguation). The English word "bear" comes from Old English bera and belongs to a family of names for the bear in Germanic languages that originate from an adjective meaning "brown". In Scandinavia, the word for bear is björn (or bjørn), and is a relatively common given name for males. The use of this name is ancient and has been found mentioned in several runestone inscriptions. 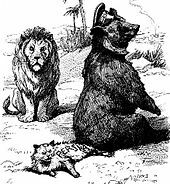 The reconstructed Proto-Indo-European name of the bear is Template:PIE, whence Sanskrit r̥kṣa, Avestan arša, Greek ἄρκτος (arktos), Latin ursus, Welsh arth (whence perhaps "Arthur"), Albanian ari, Armenian արջ (arj). Also compared is Hittite ḫartagga-, the name of a monster or predator. In the binomial name of the brown bear, Ursus arctos, Linnaeus simply combined the Latin and Greek names. The Proto-Indo-European (PIE) word for bear, Template:PIE seems to have been subject to taboo deformation or replacement in some languages (as was the word for wolf, Template:PIE), resulting in the use of numerous unrelated words with meanings like "brown one" (English bruin) and "honey-eater" (Slavic medved). Thus, some Indo-European language groups do not share the same PIE root. The family Ursidae is one of nine families in the suborder Caniformia, or "doglike" carnivores, within the order Carnivora. Bears' closest living relatives are the pinnipeds, canids, and musteloids. Additionally, members of this family possess posteriorly oriented M2 postprotocrista molars, elongated m2 molars, and a reduction of the premolars. Modern bears comprise eight species in three subfamilies: Ailuropodinae (monotypic with the giant panda), Tremarctinae (monotypic with the spectacled bear), and Ursinae (containing six species divided into one to three genera, depending on the authority). The earliest members of Ursidae belong to the extinct subfamily Amphicynodontinae, including Parictis (late Eocene to early middle Miocene, 38–18 Mya) and the slightly younger Allocyon (early Oligocene, 34–30 Mya), both from North America. These animals looked very different from today's bears, being small and raccoon-like in overall appearance, and diets perhaps more similar to that of a badger. Parictis does not appear in Eurasia and Africa until the Miocene. It is unclear whether late-Eocene ursids were also present in Eurasia, although faunal exchange across the Bering land bridge may have been possible during a major sea level low stand as early as the late Eocene (about 37 Mya) and continuing into the early Oligocene. European genera morphologically are very similar to Allocyon, and also the much younger American Kolponomos (about 18 Mya), are known from the Oligocene, including Amphicticeps and Amphicynodon. The raccoon-sized, dog-like Cephalogale is the oldest-known member of the subfamily Hemicyoninae, which first appeared during the middle Oligocene in Eurasia about 30 Mya ago. The subfamily also includes the younger genera Phoberocyon (20–15 Mya), and Plithocyon (15–7 Mya). A Cephalogale-like species gave rise to the genus Ursavus during the early Oligocene (30–28 Mya); this genus proliferated into many species in Asia and is ancestral to all living bears. Species of Ursavus subsequently entered North America, together with Amphicynodon and Cephalogale, during the early Miocene (21–18 Mya). Members of the living lineages of bears diverged from Ursavus between 15 and 20 Mya ago, likely via the species Ursavus elmensis. Based on genetic and morphological data, the Ailuropodinae (pandas) were the first to diverge from other living bears about 19 Mya ago, although no fossils of this group have been found before about 5 Mya. The New World short-faced bears (Tremarctinae) differentiated from Ursinae following a dispersal event into North America during the mid Miocene (about 13 Mya). They invaded South America (~1 Ma) following formation of the Isthmus of Panama. Their earliest fossil representative is Plionarctos in North America (~ 10–2 Ma). This genus is probably the direct ancestor to the North American short-faced bears (genus Arctodus), the South American short-faced bears (Arctotherium), and the spectacled bears, Tremarctos, represented by both an extinct North American species (T. floridanus), and the lone surviving representative of the Tremarctinae, the South American spectacled bear (T. ornatus). The subfamily Ursinae experienced a dramatic proliferation of taxa about 5.3–4.5 Mya ago, coincident with major environmental changes; with the first members of the genus Ursus also appearing around this time. The sloth bear is a modern survivor of one of the earliest lineages to diverge during this radiation event (5.3 Mya); it took on its peculiar morphology, related to its diet of termites and ants, no later than by the early Pleistocene. By 3–4 Mya ago, the species Ursus minimus appears in the fossil record of Europe; apart from its size, it was nearly identical to today's Asiatic black bear. It is likely ancestral to all bears within Ursinae, perhaps aside from the sloth bear. 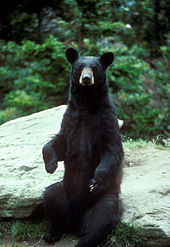 Two lineages evolved from U. minimus: the black bears (including the sun bear, the Asiatic black bear, and the American black bear); and the brown bears (which includes the polar bear). Modern brown bears evolved from U. minimus via Ursus etruscus, which itself is ancestral to both the extinct Pleistocene cave bear and today's brown and polar bears. Species of Ursinae have migrated repeatedly into North America from Eurasia as early as 4 Mya during the early Pliocene. The fossil record of bears is exceptionally good. Direct ancestor-descendent relationships between individual species are often fairly well established, with sufficient intermediate forms known to make the precise cut-off between an ancestral and its daughter species subjective. 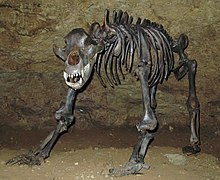 Other extinct bear genera include Agriarctos, Indarctos, and Agriotherium (sometimes placed within hemicyonids). The giant panda's taxonomy (subfamily Ailuropodinae) has long been debated. Its original classification by Armand David in 1869 was within the bear genus Ursus, but, in 1870, it was reclassified by Alphonse Milne-Edwards to the raccoon family. In recent studies, the majority of DNA analyses suggest that the giant panda has a much closer relationship to other bears and should be considered a member of the family Ursidae. Estimates of divergence dates place the giant panda as the most ancient offshoot among living taxa within Ursidae, having split from other bears as recently as 11.6 Mya to as distantly as 22.1 Mya. The red panda was included within Ursidae in the past. However, more recent research does not support such a conclusion, and instead places it in its own family Ailuridae, in superfamily Musteloidea along with Mustelidae, Procyonidae, and Mephitidae. Multiple similarities between the two pandas, including the presence of false thumbs, are thus thought to represent an example of convergent evolution for feeding primarily on bamboo. Unlike their neighbors elsewhere, the brown bears of Alaska's ABC Islands evidently are more closely related to polar bears than to other brown bears in the world. Researchers Gerald Shields and Sandra Talbot of the University of Alaska Fairbanks Institute of Arctic Biology studied the DNA of several samples of the species and found that their DNA is different from that of other brown bears. The discovery has shown that, while all other brown bears share a brown bear as their closest relative, those of Alaska's ABC Islands differ and share their closest relation with the polar bear. Also, the very rare Tibetan blue bear is a type of brown bear. This animal has never been photographed. Koalas are often referred to as bears due to their appearance; however, they are marsupials, not bears. The genera Melursus and Helarctos are sometimes also included in Ursus. The Asiatic black bear and the polar bear used to be placed in their own genera, Selenarctos and Thalarctos; these names have since been reduced in rank to subgeneric rank. A number of hybrids have been bred between American black, brown, and polar bears. Despite being quadrupeds, bears can stand and sit similarly to humans. Bears are generally bulky and robust animals with relatively short legs. They are sexually dimorphic with regard to size, with the males being larger. Larger species tend to show increased levels of sexual dimorphism in comparison to smaller species, and where a species varies in size across its distribution, individuals from larger-sized areas tend also to vary more. Bears are the most massive terrestrial members of the order Carnivora. Some exceptional polar bears and Kodiak bears (a brown bear subspecies) have been weighed at over 750 kg (1,650 lb). As to which species is the largest depends on whether the assessment is based on which species has the largest individuals (brown bears) or on the largest average size (polar bears), as some races of brown bears are much smaller than polar bears. Adult male Kodiak bears average 480 to 533 kg (1,058 to 1,175 lb) compared to an average of 386 to 408 kg (851 to 899 lb) in adult male polar bears, per the Guinness Book of World Records. The smallest bears are the sun bears of Asia, which weigh an average of 65 kg (143 lb) for the males and 45 kg (99 lb) for the females, though the smallest mature females can weigh only 20 kg (44 lb). 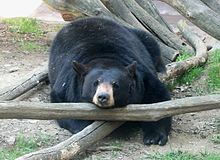 All "medium"-sized bear species (which include the other five extant species) are around the same average weight, with males averaging around 100 to 120 kg (220 to 260 lb) and females averaging around 60 to 85 kg (132 to 187 lb), although it is not uncommon for male American black bears to considerably exceed "average" weights. Head-and-body length can range from 120 cm (47 in) in sun bears to 300 cm (120 in) in large polar and brown bears and shoulder height can range from 60 cm (24 in) to over 160 cm (63 in) in the same species, respectively. The tails of bears are often considered a vestigial feature and can range from 3 to 22 cm (1.2 to 8.7 in). Unlike most other land carnivorans, bears are plantigrade. They distribute their weight toward the hind feet, which makes them look lumbering when they walk. They are still quite fast, with the brown bear reaching 48 km/h (30 mph), although they are still slower than felines and canines. Bears can stand on their hind feet and sit up straight with remarkable balance. Bears' nonretractable claws are used for digging, climbing, tearing, and catching prey. Their ears are rounded. Bears have an excellent sense of smell, better than the dogs (Canidae), or possibly any other mammal. This sense of smell is used for signalling between bears (either to warn off rivals or detect mates) and for finding food. Smell is the principal sense used by bears to find most of their food. Bears are primarily found in the Northern Hemisphere, and with one exception, only in Asia, North America and Europe. 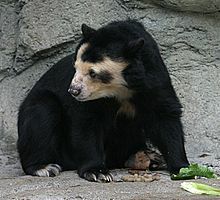 The single exception is the spectacled bear (Tremarctos ornatus); native to South America it inhabits the Andean region. The Atlas bear, a subspecies of the brown bear, was the only bear native to Africa. It was distributed in North Africa from Morocco to Libya, but has been extinct since around the 1870s. The most widespread species is the brown bear, which occurs from Western Europe eastwards through Asia to the western areas of North America. 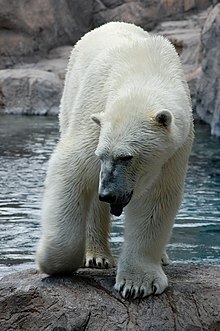 The American black bear is restricted to North America, and the polar bear is restricted to the Arctic Sea. All the remaining species are Asian. With the exception of the polar bear, bears are mostly forest species. Some species, particularly the brown bear, may inhabit or seasonally use other areas, such as alpine scrub or tundra. 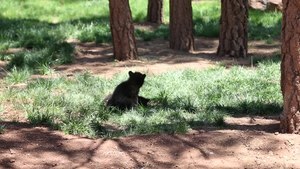 Captive black bear cubs at play. While many people think bears are nocturnal, they are, in fact, generally diurnal, active for the most part during the day. The belief that they are nocturnal apparently comes from the habits of bears that live near humans, which engage in some nocturnal activities, such as raiding trash cans or crops while avoiding humans. The sloth bear of Asia is the most nocturnal of the bears, but this varies by individual, and females with cubs are often diurnal to avoid competition with males and nocturnal predators. Bears are overwhelmingly solitary and are considered to be the most asocial of all the Carnivora. 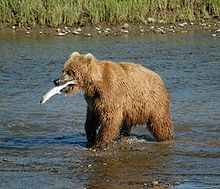 Liaisons between breeding bears are brief, and the only times bears are encountered in small groups are mothers with young or occasional seasonal bounties of rich food (such as salmon runs). Barking, produced during times of alarm, excitement or to give away the animal's position. Huffing, made during courtship or between mother and cubs to warn of danger. Growling, produced as strong warnings to potential threats or in anger. Roaring, used much for the same reasons as growls and also to proclaim territory and for intimidation. Humming, a loud monotonous buzzing sound, primarily employed by cubs. Most bears have diets of more plant than animal matter and are completely opportunistic omnivores. Some bears will climb trees to obtain mast (edible vegatative or reproductive parts, such as acorns); smaller species that are more able to climb include a greater amount of this in their diets. Such masts can be very important to the diets of these species, and mast failures may result in long-range movements by bears looking for alternative food sources. One exception is the polar bear, which has adopted a diet mainly of marine mammals to survive in the Arctic. The other exception is the giant panda, which has adopted a diet mainly of bamboo. Stable isotope analysis of the extinct giant short-faced bear (Arctodus simus) shows it was also an exclusive meat-eater, probably a scavenger. The sloth bear, though not as specialized as the previous two species, has lost several front teeth usually seen in bears, and developed a long, suctioning tongue to feed on the ants, termites, and other burrowing insects they favour. At certain times of the year, these insects can make up 90% of their diets. All bears will feed on any food source that becomes available, the nature of which varies seasonally. A study of Asiatic black bears in Taiwan found they would consume large numbers of acorns when they were most common, and switch to ungulates at other times of the year. When taking warm-blooded animals, bears will typically take small or young animals, as they are easier to catch. However, both species of black bears and the brown bear can sometimes take large prey, such as ungulates. Often, bears will feed on other large animals when they encounter a carcass, whether or not the carcass is claimed by, or is the kill of, another predator. This competition is the main source of interspecies conflict. Bears are able to defend a carcass against some comers. Mother bears also can usually defend their cubs against other predators. The tiger is the only predator known to regularly prey on adult bears, including fully grown adults of brown bears, sloth bears, Asiatic black bears and sun bears When hunting bears, tigers will position themselves from the leeward side of a rock or fallen tree, waiting for the bear to pass by. When the bear passes, the tiger will spring from an overhead position and grab the bear from under the chin with one forepaw and the throat with the other. The immobilised bear is then killed with a bite to the spinal column. After killing a bear, the tiger will concentrate its feeding on the bear's fat deposits, such as the back, legs and groin. The age at which bears reach sexual maturity is highly variable, both between and within species. Sexual maturity is dependent on body condition, which is in turn dependent upon the food supply available to the growing individual. The females of smaller species may have young in as little as two years, whereas the larger species may not rear young until they are four or even nine years old. First breeding may be even later in males, where competition for mates may leave younger males without access to females. The bear's courtship period is very brief. Bears in northern climates reproduce seasonally, usually after a period of inactivity similar to hibernation, although tropical species breed all year round. Cubs are born toothless, blind, and bald. The cubs of brown bears, usually born in litters of one to three, will typically stay with the mother for two full seasons. They feed on their mother's milk through the duration of their relationship with their mother, although as the cubs continue to grow, nursing becomes less frequent and cubs learn to begin hunting with the mother. They will remain with the mother for about three years, until she enters the next cycle of estrus and drives the cubs off. Bears will reach sexual maturity in five to seven years. Male bears, especially polar and brown bears, will kill and sometimes devour cubs born to another father to induce a female to breed again. Female bears are often successful in driving off males in protection of their cubs, despite being rather smaller. Many bears of northern regions are assumed[by whom?] to hibernate in the winter, a belief supported by a number of scientific studies. While many bear species do go into a physiological state often colloquially called "hibernation" or "winter sleep", it is not true hibernation. In true hibernators, body temperatures drop to near ambient and heart rates slow drastically, but the animals periodically rouse themselves to urinate or defecate and to eat from stored food. The body temperature of bears, on the other hand, drops only a few degrees from normal, and the heart rate slows from a normal value of 55 to just 9 beats per minute. They normally do not wake during this "hibernation", so do not eat, drink, urinate, or defecate the entire period. Higher body heat and being easily roused may be adaptations, because females give birth to their cubs during this winter sleep. 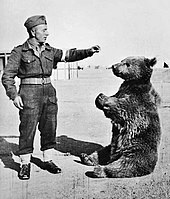 Wojtek the bear with a Polish soldier: During the Battle of Monte Cassino, Wojtek helped move ammunition. Some species, such as the polar bear, American black bear, sloth bear, and brown bear, are dangerous to humans, especially in areas where they have become used to people. All bears are physically powerful and are likely capable of fatally attacking a person, but they, for the most part, are shy, are easily frightened and will avoid humans. Injuries caused by bears are rare, but are often widely reported. The danger that bears pose is often vastly exaggerated, in part by the human imagination. However, when a mother feels that her cubs are threatened, she will behave ferociously. It is recommended to give all bears a wide berth because they are behaviorally unpredictable. Where bears raid crops or attack livestock, they may come into conflict with humans. These problems may be the work of only a few bears, but they create a climate of conflict, as farmers and ranchers may perceive all losses as due to bears and advocate the preventive removal of all bears. Mitigation methods may be used to reduce bear damage to crops, and reduce local antipathy towards bears. Laws have been passed in many areas of the world to protect bears from habitat destruction. Public perception of bears is often very positive, as people identify with bears due to their omnivorous diets, ability to stand on two legs, and symbolic importance, and support for bear protection is widespread, at least in more affluent societies. In more rural and poorer regions, attitudes may be more shaped by the dangers posed by bears and the economic costs they cause to farmers and ranchers. Some populated areas with bear populations have also outlawed the feeding of bears, including allowing them access to garbage or other food waste. Bears in captivity have been trained to dance, box, or ride bicycles; however, this use of the animals became controversial in the late 20th century. Bears were kept for baiting in Europe at least since the 16th century. Some cultures use bears for food and folk medicine. Their meat is dark and stringy, like a tough cut of beef. In Cantonese cuisine, bear paws are considered a delicacy. The peoples of China, Japan, and Korea use bears' body parts and secretions (notably their gallbladders and bile) as part of traditional Chinese medicine. More than 12,000 bile bears are thought to be kept on farms, for their bile, in China, Vietnam, and South Korea. Bear meat must be cooked thoroughly, as it can be infected with Trichinella spiralis, which can cause trichinosis. The female first name "Ursula", originally derived from a Christian saint's name and common in English- and German-speaking countries, means "little she-bear" (diminutive of Latin ursa). In Switzerland, the male first name "Urs" is especially popular, while the name of the canton and city of Bern is derived from Bär, German for bear. The Germanic name Bernard (including Bernhardt and other forms) means "bear-brave", "bear-hardy", or "bold bear". In Scandinavia, the male personal names Björn (Sweden, Iceland) and Bjørn (Norway, Denmark), meaning "bear", are relatively common. In Finland, the male personal name Otso is an old poetic name for bear, similar to Kontio. In Russian and other Slavic languages, the word for bear, medved (медведь), and variants or derivatives, such as Medvedev, are common surnames. In East European Jewish communities, the name Ber (בער)—Yiddish cognate of "Bear"—has been attested as a common male first name, at least since the 18th century, and was, among others, the name of several prominent rabbis. The Yiddish Ber is still in use among Orthodox Jewish communities in Israel, the US, and other countries. With the transition from Yiddish to Hebrew under the influence of zionism, the Hebrew word for "bear", dov (דב), was taken up in contemporary Israel and is at present among the commonly used male first names in that country. "Ten Bears" (Paruasemana) was the name of a well-known 19th century chieftain among the Comanche. Also among other Native American tribes, bear-related names are attested. For bears in mythology, see Jean de l'Ours, Arcturus, Ursa Major, Berserker, and Kalevala. There is evidence of prehistoric bear worship. Anthropologists such as Joseph Campbell have regarded this as a common feature in most of the fishing and hunting-tribes. The prehistoric Finns, along with most Siberian peoples, considered the bear as the spirit of one's forefathers. This is why the bear (karhu) was a greatly respected animal, with several euphemistic names (such as otso, mesikämmen and kontio). The bear is the national animal of Finland. This kind of attitude is reflected in the traditional Russian fairy tale "Morozko", whose arrogant protagonist Ivan tries to kill a mother bear and her cubs—and is punished and humbled by having his own head turned magically into a bear's head and being subsequently shunned by human society. "The Brown Bear of Norway" is a Scottish fairy tale telling the adventures of a girl who married a prince magically turned into a bear, and who managed to get him back into a human form by the force of her love and after many trials and difficulties. In the 1970s, this story was adapted into the East German fantasy film The Singing Ringing Tree and broadcast on British television. Evidence of bear worship has been found in early Chinese and Ainu cultures, as well (see Iomante). Korean people in their mythology identify the bear as their ancestor and symbolic animal. According to the Korean legend, a god imposed a difficult test on a she-bear; when she passed it, the god turned her into a woman and married her. Legends of saints taming bears are common in the Alpine zone. In the arms of the bishopric of Freising, the bear is the dangerous totem animal tamed by St. Corbinian and made to carry his civilised baggage over the mountains. A bear also features prominently in the legend of St. Romedius, who is also said to have tamed one of these animals and had the same bear carry him from his hermitage in the mountains to the city of Trento. Similar stories are told of Saint Gall and Saint Columbanus. This recurrent motif was used by the Church as a symbol of the victory of Christianity over paganism. In the Norse settlements of northern England during the 10th century, a type of "hogback" grave cover of a long narrow block of stone, with a shaped apex like the roof beam of a long house, is carved with a muzzled, thus Christianised, bear clasping each gable end. Though the best collection of these is in the church at Brompton, North Yorkshire, their distribution ranges across northern England and southern Scotland, with a scattered few in the north Midlands and single survivals in Wales, Cornwall, and Ireland; a late group is found in the Orkney Islands. Bears are a popular feature of many children's stories, including Goldilocks and "The Story of the Three Bears", the Berenstain Bears, and Winnie the Pooh. "En uheldig bjørnejakt" (An Unfortunate Bear Hunt) by Theodor Kittelsen. According to his hagiography, a bear killed Saint Corbinian's pack horse on the way to Rome, so the saint commanded it to carry his load. Once he arrived in Rome, however, he let the bear go. For more details on this topic, see Bear in heraldry. The Russian bear is a common national personification for Russia (as well as the Soviet Union). 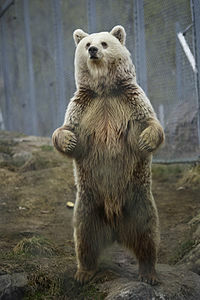 The brown bear is also Finland's national animal. In the United States, the black bear is the state animal of Louisiana, New Mexico, and West Virginia; the grizzly bear is the state animal of both Montana and California. Bears also appear in the state seals of California and Missouri. In the UK, the bear and staff has long featured on the heraldic arms of Warwickshire county. Bears appear in the canting arms of Bern and Berlin. Bear symbols are used extensively in Berlin street decorations. 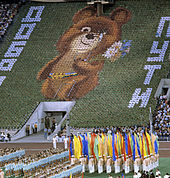 Also, "bear", "bruin", or specific types of bears are popular nicknames or mascots, for example, for sports teams (Bayern Munich, Chicago Bears, California Golden Bears, UCLA Bruins, Boston Bruins); and a bear cub called Misha was mascot of the 1980 Summer Olympics in Moscow, Soviet Union. Smokey Bear has become a part of American culture since his introduction in 1944. Known to almost all Americans, he and his message, "Only you can prevent forest fires" (updated in 2001 to "Only you can prevent wildfires"), have been a symbol of preserving woodlands. Smokey wears a hat similar to one worn by U.S. Forest Service rangers; state police officers in some states wear a similar style, giving rise to the CB slang "bear" or "Smokey" for the highway patrol. The name Beowulf has been hypothesized to mean "bee-wolf", a kenning for "bear". The physical attributes and behaviours of bears are commonly used in figures of speech in English. In the stock market, a bear market is a period of declining prices. Pessimistic forecasting or negative activity is said to be bearish (due to the stereotypical posture of bears looking downwards), and one who expresses bearish sentiment is a bear. Its opposite is a bull market, and bullish sentiment from bulls. In gay slang, the term "bear" refers to male individuals who possess physical attributes much like a bear, such as a heavy build, abundant body hair, and commonly facial hair. A bear hug is typically a tight hug that involves wrapping one's arms around another person, often leaving that person's arms immobile. Bear tracking – in the old Western states of the U.S. and, to this day, in the former Dakota Territory, the expression "you ain't just a bear trackin'" is used to mean "you ain't lying" or "that's for sure". This expression evolved as an outgrowth of the experience pioneer hunters and mountainmen had when tracking bear. Bears often lay down false tracks and are notorious for doubling back on anything tracking them. If you are not following bear tracks, you are not following false trails or leads in your thoughts, words or deeds. In Korean culture, a person is referred to as being "like a bear" when they are stubborn or not sensitive to what is happening around their surroundings. Used as a phrase to call a person "stubborn bear". The Bible compares King David's "bitter warriors", who fight with such fury that they could overcome many times their number of opponents, with "a bear robbed of her whelps in the field" (2 Samuel 17:8 s:Bible (King James)/2 Samuel#Chapter 17). The phrase "a bereaved bear" (דב שכול), derived from this Biblical source, is still used in the literary Hebrew of contemporary Israel. Around the world, many children have stuffed toys in the form of bears. Two authoritative organizations for seeking scientific information on bear species of the world are the International Association for Bear Research & Management, also known as the International Bear Association (IBA); and the Bear Specialist Group of the Species Survival Commission, a part of the International Union for the Conservation of Nature. These organizations focus on the species' natural history, management, and conservation. Asiatic black bear: "Moon Bears". North American black bear: "Black Bear Conservation Coalition". Polar bear: "Polar Bears International". Sun bear: "Bornean Sun Bear Conservation Centre". Andean bear: "Andean Bear Conservation Project". Giant panda: "Chengdu Research Base of Giant Panda Breeding". ^ "Slovakia warns of tipsy bears". Archived from the original on 2010-11-18. Retrieved 2008-11-11. ^ Peter Tyson is editor in chief of NOVA Online. "Bear Essentials of Hibernation". Pbs.org. Retrieved 2013-09-26. ^ Votruba, Martin. "Bears". Slovak Studies Program. University of Pittsburgh. Archived from the original on 2010-11-18. Retrieved 2009-03-12. ^ Kemp, T.S. (2005). The Origin and Evolution of Mammals. Oxford University Press. ISBN 978-0-19-850760-4. ^ Wang Banyue and Qiu Zhanxiang (2005). "Notes on Early Oligocene Ursids (Carnivora, Mammalia) from Saint Jacques, Nei Mongol, China" (PDF). Bulletin of the American Museum of Natural History. 279 (279): 116–124. doi:10.1206/0003-0090(2003)279<0116:C>2.0.CO;2. Archived from the original on 2009-11-20. ^ Waits, Lisette (1999). "Rapid radiation events in the family Ursidae indicated by likelihood phylogenetic estimation from multiple fragments of mtDNA" (PDF). Molecular Phylogenetics and Evolution. 13: 82–92. doi:10.1006/mpev.1999.0637. Retrieved 17 November 2014. ^ Pàges, Marie (2008). "Combined analysis of fourteen nuclear genes refines the Ursidae phylogeny" (PDF). Molecular Phylogenetics and Evolution. 47: 73–83. doi:10.1016/j.ympev.2007.10.019. Retrieved 17 November 2014. ^ a b c d Lua error in package.lua at line 80: module 'Module:Citation/CS1/Suggestions' not found. ^ Qiu Zhanxiang (2003). "Dispersals of Neogene Carnivorans between Asia and North America" (PDF). Bulletin American Museum of Natural History. 279 (279): 18–31. doi:10.1206/0003-0090(2003)279<0018:C>2.0.CO;2. Archived from the original on 2009-11-20. ^ Kutschera, Verena (2014). "Bears in a forest of gene trees: Phylogenetic inference is complicated by incomplete lineage sorting and gene flow". Molecular Biology and Evolution. 31: 2004–2017. doi:10.1093/molbev/msu186. Retrieved 17 November 2014. ^ Flynn, J. J.; Nedbal, M. A.; Dragoo, J. W.; Honeycutt, R. L. (2000). "Whence the Red Panda?" (PDF). Molecular Phylogenetics and Evolution. 17 (2): 190–199. doi:10.1006/mpev.2000.0819. PMID 11083933. Retrieved 2009-09-23. ^ Flynn, J. J.; Nedbal, M. A. (1998). "Phylogeny of the Carnivora (Mammalia): Congruence vs Incompatibility among Multiple Data Sets". Molecular Phylogenetics and Evolution. 9 (3): 414–426. doi:10.1006/mpev.1998.0504. PMID 9667990. Archived from the original on 2010-11-18. . Retrieved 2009-10-08. ^ "The Brown Bear: Father of the Polar Bear?, Alaska Science Forum". Gi.alaska.edu. 1996-12-05. Archived from the original on 2010-01-17. Retrieved 2010-10-16. ^ Derocher, Andrew E.; Andersen, Magnus; Wiig, Øystein (2005). "Sexual dimorphism of polar bears" (PDF). Journal of Mammalogy. 86 (5): 895–901. doi:10.1644/1545-1542(2005)86[895:SDOPB]2.0.CO;2. ^ a b c d e f Garshelis, David L. (2009). "Family Ursidae (Bears)". In Wilson, Don; Mittermeier, Russell. Handbook of the Mammals of the World. Volume 1: Carnivores. Barcelona: Lynx Edicions. ISBN 978-84-96553-49-1. ^ Bunnell, Fred (1984). Macdonald, D., ed. The Encyclopedia of Mammals. New York: Facts on File. p. 87. ISBN 978-0-87196-871-5. ^ Matheus, Paul E. (1995). "Diet and Co-ecology of Pleistocene Short-Faced Bears and Brown Bears in Eastern Beringia". Quaternary Research. 44 (3): 447–453. doi:10.1006/qres.1995.1090. ^ Joshi, Anup; Garshelis, David L.; Smith, James L. D. (1997). "Seasonal and Habitat-Related Diets of Sloth Bears in Nepal". Journal of Mammalology. 1978 (2): 584–597. doi:10.2307/1382910. ^ a b Hwang, Mei-Hsiu (2002). "Diets of Asiatic black bears in Taiwan, with Methodological and Geographical Comparisons" (PDF). Ursus. 13: 111–125. ^ Seryodkin, Ivan (2006). "The ecology, behavior, management and conservation status of brown bears in Sikhote-Alin (in Russian)". Far Eastern National University, Vladivostok, Russia. pp. 1–252. ^ Geptner, V. G., Sludskii, A. A. (1972). Mlekopitaiuščie Sovetskogo Soiuza. Vysšaia Škola, Moskva. (In Russian; English translation: Heptner, V. G.; Sludskii, A. A.; Bannikov, A. G.; (1992). the Soviet Union. Volume II, Part 2: Carnivora (Hyaenas and Cats). Smithsonian Institution and the National Science Foundation, Washington DC). Pp. 95–202. ^ Kawanishi, K. and M. E. Sunquist (2004). Conservation status of tigers in a primary rainforest of Peninsular Malaysia. Biological Conservation 120: 329–344. ^ V.G Heptner & A.A. Sludskii. Mammals of the Soviet Union, Volume II, Part 2. pp. 175–177. ISBN 90-04-08876-8. ^ Anatoliy Grigorievitch Yudakov and Igor Georgievitch Nikolaev (2004). "Hunting Behavior and Success of the Tigers' Hunts". The Ecology of the Amur Tiger based on Long-Term Winter Observations in 1970-1973 in the Western Sector of the Central Sikhote-Alin Mountains (english translation ed.). Institute of Biology and Soil Science, Far-Eastern Scientific Center, Academy of Sciences of the USSR. ^ Gerhard Heldmeier (2011). "Life on Low Flame in Hibernation". Science. 331 (6019): 866–867. doi:10.1126/science.1203192. ^ Clark, Douglas (2003). "Polar Bear–Human Interactions in Canadian National Parks, 1986–2000" (PDF). Ursus. 14 (1): 65–71. ^ a b Fredriksson, Gabriella (2005). "Human–sun bear conflicts in East Kalimantan, Indonesian Borneo". Ursus. 16 (1): 130–137. doi:10.2192/1537-6176(2005)016[0130:HBCIEK]2.0.CO;2. ^ a b c Goldstein, Isaac; Paisley, Susanna; Wallace, Robert; Jorgenson, Jeffrey P.; Cuesta, Francisco; Castellanos, Armando (2006). "Andean bear–livestock conflicts: a review". Ursus. 17 (1): 8–15. doi:10.2192/1537-6176(2006)17[8:ABCAR]2.0.CO;2. ^ Black, Richard (2007-06-11). "BBC Test kit targets cruel bear trade". BBC News. Archived from the original on 2010-11-18. Retrieved 2010-01-01. ^ "Trichinellosis Associated with Bear Meat". Archived from the original on 30 September 2006. Retrieved 2006-10-04. ^ "Bear meat poisoning in Siberia". BBC News. 1997-12-21. Retrieved 2006-10-04. ^ "Finnish Food Safety Authority: Bear meat must be inspected before serving in restaurants". Retrieved 2006-10-04. ^ http://www.constellationsofwords.com/Constellations/UrsaMajor.html, Ursa Major - the Greater Bear, Retrieved Mar. 11, 2015. ^ http://www.ancestry.com/name-origin?surname=bernhard, Bernhard Family History, Retrieved Mar. 11, 2015. ^ Pastoreau, Michel (2007) L'ours. Historie d'un roi déchu, Seuil ISBN 2-02-021542-X. ^ Noted and illustrated in Hall, Richard (1995) Viking Age Archaeology, p. 43 and fig. 22, ISBN 0-7478-0063-4. ^ "The first Buddy Bears in Berlin". Buddy Bear Berlin. Buddy Bär Berlin GmbH. 2008. Retrieved 30 January 2014. ^ "Vision and Mission". Bear Trust International. 2002–2012. Retrieved March 8, 2014. This page was last edited 21:39, 31 March 2015 by Wikipedia user Jdforrester (WMF). Based on work by Wikipedia anonymous users imported>Rjwilmsi and imported>Prot D.